The Heavy Duty (HD) Whirligig is a fully guarded target for easy mounting of motion sensors. It is suitable for use with 4B's range of inductive proximity sensors including the M100 Stopswitch, P100 Proxswitch, and P300 Proxswitch. Used on conveyors, bucket elevators and other rotating machinery, the HD Whirligig monitors shaft speed for continuous, low speed or high speed conditions. The sensor (sold separately) inserts into the housing of the HD Whirligig and the complete assembly bolts to the machines shaft through a 5/8” UNC tapped hole. Machine vibration or movement does not affect the performance of the sensor as the whole assembly moves with the shaft. The all stainless steel construction and sealed twin stainless steel bearings make the HD Whirligig ideal for use in corrosive and other extreme environments. With the HD Whirligig, sensor installation is now simple, safe and reliable. The DIN rail mounted Speed Relay has a user adjustable underspeed contact output that can sound an alarm or shutdown machinery when the shaft speed falls below the preset level. 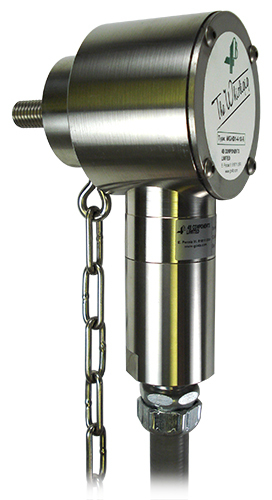 The M100 Stopswitch is a simple inductive shaft speed monitoring device. The self-contained unit has a single set point, which signals when the shaft has stopped rotating. It can be used for process control, motion detection and stopped shaft indication. Inductive proximity sensor designed to detect shaft speed, shaft position, gate position, or object presence in conveyors, elevators and other machinery. No FAQ's currently available for this product.